Wednesday 26th April kicked off the Hampshire Motability Motor Show at the Ageas Bowl in Southampton. The day was a great success and a fantastic way to generate awareness of the wide range of vehicles available on the Motability Scheme. ​Snows, Picador PLC and Hendy Group all joined forces to celebrate the Motability Scheme and what it can offer to all customers who are eligible. The event showcased a huge selection of vehicles from 14 manufacturer brands, including BMW, Citroen, Ford, Honda, Dacia, Kia, Mazda, MINI, Peugeot, Renault, SEAT, Toyota, Vauxhall and Volvo. The extensive range of cars on offer was well received by customers, as it proudly displayed how many of the latest models can be made available to those who qualify for the Motability scheme. ​Visitors were not only able to browse an impressive selection of vehicles, but also able to discuss conversions and adaptation options with 2 vehicle adaptation specialists; Chapman Car Care and TBC Conversions. In fact, Chapman Car Care were also carrying out safety checks on people's existing vehicle adaptations. Allied Vehicles were also on hand to display and provide information on wheelchair accessible vehicles. The event saw around 600 attendees, consisting of existing Motability customers, those who are new to the Scheme and looking to see how it can benefit them, and also people visiting on behalf of someone who is eligible. Our Motability Teams were delighted to meet and assist those who attended the event. We look forward to welcoming many of these new faces into our dealerships, where we hope to provide complete guidance through the Motability journey, from start to finish. 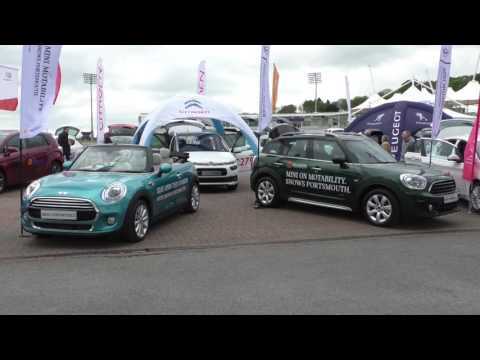 Solent TV were on hand to provide coverage of the Hampshire Motability Motor Show. If you are interested in finding out more you can view the video below. If you wish to find out more about the Motability offers that Snows provide, you can contact all our dealerships directly, or make an enquiry and a member of our helpful team will get back to you as soon as possible. Snows is delighted to represent a range of reputable marques suitable for Motability Scheme customers. Choose from BMW; KIA; MINI; Peugeot; SEAT; Toyota; and Volvo, in dealerships located across the South from Plymouth to Guildford. The Group prides itself on its reputation and dedication to delivering excellent customer service, and is rewarded by the fact that over half of its business comes from returning customers. With Snows, driving becomes an experience, rather than a chore.